We are engaged in meeting the demands of supplying specially designed Cutting Machine. These Specimen Cutting Machine for Sample Preparation are specially made of high quality raw materials sourced from trusted manufacturers of industry. We are the leading manufacturer and supplier of Radial Lead Cutting Machine. 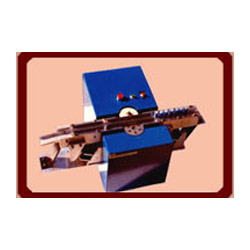 We are engaged in offering a wide range of radial lead cutter bender. All our products are manufactured using excellent quality spare parts and components. Our range includes extremely durable Lead Cutting Machine that is widely used for the lead cutting operations for different industries. Voltage 60 watts. 220V AC. MODEL: IR.22 : Is an automatic lead cutting machine for Loose and Taped Radial components. The machine employes a vibratory track feeder to trasportlconvey loose radial components from the loading end to the rotory lead cutting section and then to the un-loading end of the vibratory track. The conveying speed is controlled by varying the amplitude of the vibratory track through the power-pack supplied with the machine .The lead length to be cut can be easily adjusted and set by using suitable track spacers supplied with the machine. 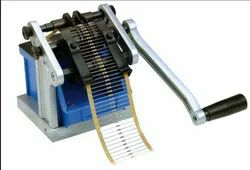 For Taped Radials, the tape is inserted through the track and the cutting rollers pull and cut the leads with slight assistance of the operator. The machine can cut 5,000 to 20,000 components per hour in LooselTape-feed depending on the efficiency of the operator, who has to hand place loose components as fast as he can, at the loading end of the vibratory track. Power 60 watts. 220V AC. Production capacity 5, 000 to 20,000 components/HR. Dimensions 380 x 450 x 225. (L x W x H). Looking for Cutting Machine ?